Never sure what Direction I'm going in. Her is my new WB "Direction" I hope gets you all going the right way. Make with my usual love and care. Window 7/8/10. User Pic instructions included if you want to use one. Please enjoy. Good job, Dave! 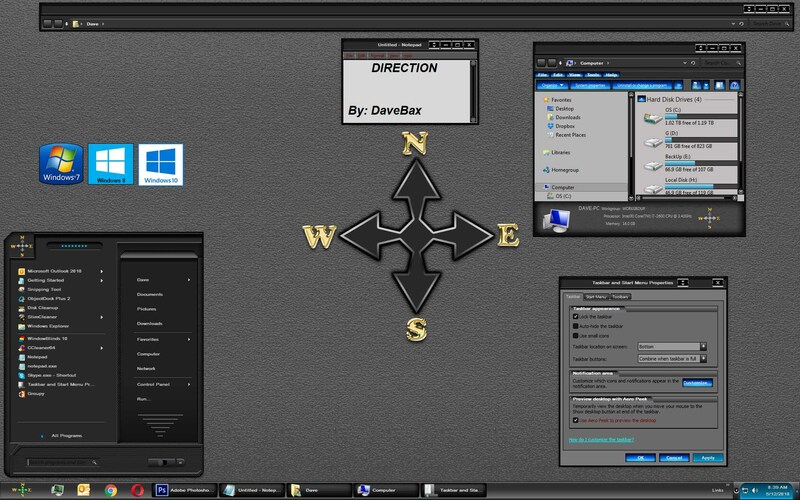 I like the 3D look of the start menu, and the color. Love me a dark theme! Novel idea Dave, looks great! Very nice skin indeed Dave, great work. Thank you DB. Gonna go try it on for size. TRULY LOVE YOUR WORK ON THIS ONE!!!! QUESTION: AS THE IDIOT OF THE DAY, I CANNOT DETERMINE HOW TO ACTIVATE THE "RESTART" FUNCTION. I HAD IT COME UP ONCE BY ACCIDENT, BUT HAVE BEEN UNABLE TO RECALL IT. HELP PLEASE IF YOU'D BE SO KIND. Would love to help you however not sure what you are asking. If anyone else knows please help. SIR, WHAT'S I AM TRYING TO SAY IS THAT WHEN I HIT THE "START" ICON I SEE A NEAT LITTLE SLIDER THAT HAS A BLUE LIGHT ON IT. IF I HIT THAT IT WILL SHUT DOWN MY COMPUTER. WHERE I AM HAVING DIFFICULTY IS, "WHAT DO I HIT TO GET THE "RESTART" SCHEDULE TO COME UP? SIR, WHAT'S I AM TRYING TO SAY IS THAT WHEN I HIT THE "START" ICON I SEE A NEAT LITTLE SLIDER THAT HAS A BLUE LIGHT ON IT. IF I HIT THAT IT WILL SHUT DOWN MY COMPUTER. WHERE I AM HAVING DIFFICULTY IS, "WHAT DO I HIT TO GET THE "RESTART" SCHEDULE TO COME UP? I see. That change to blue is on the left shut down button. The Blue change is just for a mouseover effect. Next to it is a small button that has a - symbol on it. That is the one to push that brings up a menu with the Restart option on it. YOUR PROMPT AND PROFESSIONAL REPLY HAS ALLOWED THE VILLAGE IDIOT TO COME INTO THE PROVERBIAL LIGHT. SURE DO LOVE YOUR WORK!!!! Thank you Nikos and Mindy. Quite welcome ski and thanks for your comment.